Unbeaten contender Ahmed Elbiali will take on former world champion Jean Pascal in the 10-round light heavyweight main event of a special Friday night edition of Premier Boxing Champions TOE-TO-TOE TUESDAYS on FS1 and BOXEO DE CAMPEONES on FOX Deportes, December 8 from Hialeah Park in Miami, Florida. 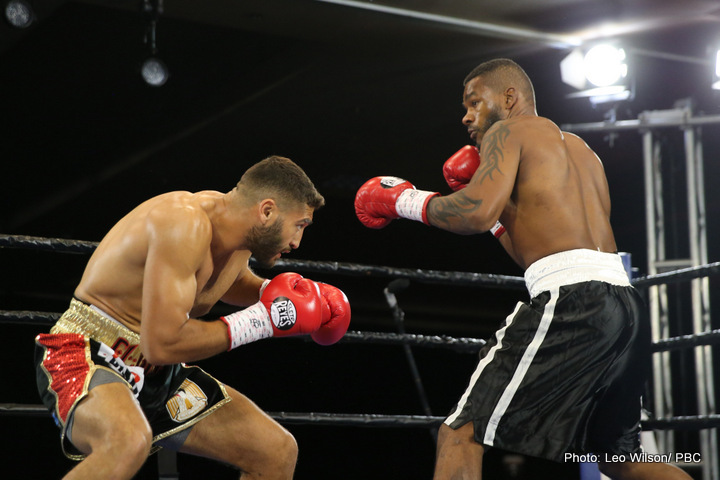 Televised coverage begins at 9 p.m. ET/6 p.m. PT and features former two-time world champion Chad Dawson against hard-hitting contender Edwin Rodriguez in a 10-round bout plus a showdown between unbeaten prospects Austin Dulay (11-0, 8 KOs) and Raynell Williams (12-0, 6 KOs) in eight rounds of lightweight action. The 27-year-old Elbiali (16-0, 13 KOs) is a powerful 175-pound contender looking to prove he stacks up with the other big punchers in the division. Born in Cairo, Egypt and now living in Miami, he will be fighting before a hometown crowd in a major step up bout against the former 175-pound champion Pascal. Elbiali is coming off a TKO victory against Christopher Brooker in his last fight on July 18 after previously stopping Jackson Junior in March. Pascal (31-5-1, 18 KOs) was born in Port-au-Prince, Haiti but now lives in Laval, Quebec, Canada, and won the light heavyweight title with a decision victory over Adrian Diaconu. He went on to make three defenses, including a victory over Chad Dawson, before losing the title to Bernard Hopkins in 2011. The 34-year-old is looking to bounce back from losing a majority decision to Eleider Alvarez in his last fight on June 3. The 35-year-old Dawson (34-5, 19 KOs) is a two-time light heavyweight champion who has been in the ring against some of the best boxers in the division throughout this era. He won the light heavyweight world championship with a unanimous decision victory over Tomasz Adamek in 2007 and lost the title via a technical decision to Jean Pascal in 2010. He regained the belt with a majority decision victory over Bernard Hopkins in 2012 before losing to Andre Ward later that year. Fighting out of New Haven, Connecticut, Dawson is coming off a technical knockout loss to Andrzej Fonfara in his last fight on March 4. Rodriguez (29-2, 20 KOs) has the kind one-punch knockout power that makes him a dangerous opponent against anyone in the division. Rodriguez was born in Moca, Dominican Republic and now lives in Worchester, Mass. while training out of Houston. The 32-year-old lost a unanimous decision to Andre Ward in his biggest bout to date and he most recently scored a technical knockout victory over Melvin Russell on July 18.